The meeting is for Segment A. Earlier this year, the Metro Board selected B4 as the locally preferred alternative for Segment B.
Metro invites the public to participate in two community meetings on Thursday, June 29, 2017, to share design elements for Segment A as well as the next steps for the Rail to River project. Segment A would construct a walking and biking path along an old railroad right-of-way between the Crenshaw/LAX Line’s Fairview Heights Station and the Blue Line’s Slauson Station. The project would make it easier for pedestrians and cyclists to reach the Crenshaw/LAX Line, Silver Line, Blue Line, many busy north-south bus lines, neighborhoods and jobs in South Los Angeles. 3 p.m. to 5 p.m. and 6 p.m. to 8 p.m.
5850 S. Main St., Los Angeles, in the second floor auditorium. The meetings will include an overview and update of the project, present the improvements for pedestrians and bicyclist to surrounding neighborhoods. All Metro meetings are held in American with Disability Act (ADA) accessible facilities. Other ADA accommodations are available by calling (323) 486-3876 or California Relay Service at 711 at least 72 hours in advance of the meetings. For more information on the project call (213) 922-9228 or e-mail r2r@metro.net or visit www.metro.net/projects/r2r. For information in Spanish dial (323) 466-3876 X 2. For Chinese Mandarin, Japanese, Korean, Thailand, Tagalog (Filipino), Vietnamese, Armenian and Cambodian please call (323) 466-3876, extension 3. Don’t we have enough pavement in this part of Los Angeles? This track is already inn-place. This corridor needs to be a rail connection not a bike-way. Using the current tracks and adding passing sidings, 6 minute service could be maintained, adding overhead trolley wire for under $100,000.00 a mile using wooden poles. High platform stations could be built for the soon to be surplus Nippon Sharyo Blue Line cars for this service. Building a light rail line would cost little more than building a bike path and serve many more people. Would this be a popular bike route if built? The quieter pearling streets would make a better bike route. Using the UP Randolph corridor from the Blue line to the River would now serve Huntington Park and share this portion of the line with the West Santa Ana Line. This would only be the first phase. The needed Brea – LAX line along the UP Brea Line and the authority owned Slauson corridor. This line would serve North Orange County, Brea, La Habra, Santa Fe Springs,Whittier, Pico Rivera, Bell, Maywood, Huntington Park, South Los Angeles, Inglewood and LAX. 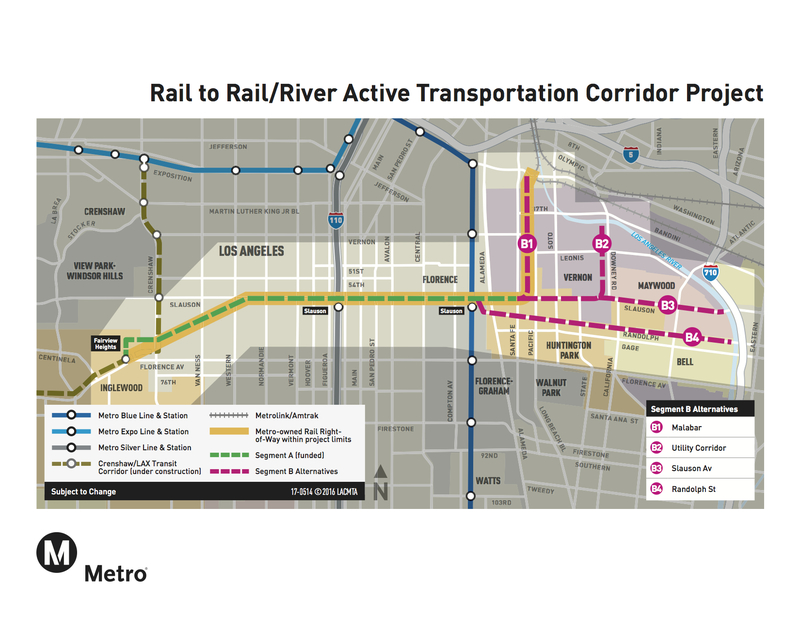 With this route there would be no need for the Gold Line extension to Whittier. An east west line would serve a denser and more needed corridor than a north south corridor between Whittier and East Los Angeles. This needed line is impotent and must be put on the Measure M project list instead of the Gold Line Whittier extension.